Readership: Wagyu World’s reach includes breeders from all across North and South America, Europe, Australia, and Japan. 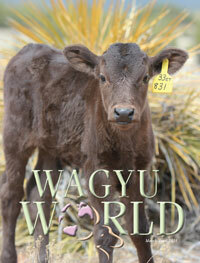 Frequency: Wagyu World is published bi-monthly; Six issues a year. FRONT COVER OPPORTUNITIES AND FREQUENCY DISCOUNTS AVAILABLE. CALL FOR DETAILS. Contact us regarding any ad question or specs not found here. Wagyu World will build your ad at no additional charge. You may also send in camera ready files. Digital files are accepted in MAC and PC formats: InDesign (properly packaged), Illustrator, Photoshop and PDF (high resolution).